Want to see a catalog? 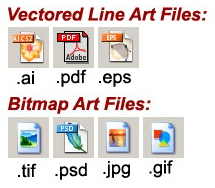 Electronic artwork files are required by some shops, but we do not require them. We will take your idea or graphic needs on an individual basis. If you don't have one of the electronic file types listed on the right, that's ok. We will work with sketches, print outs, faxes, ideas over the phone or whatever you can send us. Y-Not Promotions is PC based. *Please convert all text to outlines, curves, or paths. * Please save all files at 300dpi or higher. * For high end photographic work, a reference image is essential, a color proof, or offset printed piece. * Electronic transfer is an easy and convenient way to send your files. If you have any questions about file formats or converting your text to outlines curves or paths please call us at 973-247-0011 or e-mail us! DON'T SEE YOUR FILE TYPE ABOVE?? and our Art Department will be happy to assist you.